There is a vast amount of information available to parents on this website as well as on the secure online site, myChurchie. watch the latest school videos and view photos in the photo gallery. 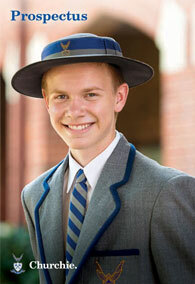 Churchie provides parents with access to myChurchie, a secure site for students, teachers and parents. An individual user name and password is required. The myChurchie portal allows parents to view announcements and links into your son’s academic, year level, house and co-curricular sites as well as access to parent teacher interviews, financial statements, emotional intelligence reports, academic reports, student timetables, updating contact details and student medical information. The School Handbook is available through the portal, the absentee pages, permission forms for medical and media consents as well as all boarding documents and tuckshop ordering and account details. To use any of these resources and access myChurchie please click here. If you have forgotten your myChurchie password please use the self-service password reset portal. If you have forgotten your myChurchie user name or are experiencing an issue using the portal, please let us know by filling in the myChurchie assistance form.